Vishal's on-going Tamil flick in the direction of his Pandiyanadu filmmaker Suseenthiran has been titled. Tall Handsome Vishal has got one of the Superstar Rajinikanth's titles 'Paayum Puli' for his upcoming movie. Vishal Krishna Reddy's Tamil actioner is titled after superstar Rajinikanth's 1983 blockbuster "Paayum Puli". This is the second time Vishal has named his movie after the superstar's film. Last year, Vishal's Tamil thriller "Naan Sigappu Manithan" was also named after a Rajinikanth film. The makers of "Paayum Puli" announced the title on Twitter on Thursday. Being directed by Suseenthiran, the movie features Vishal as an undercover policeman in Madurai. 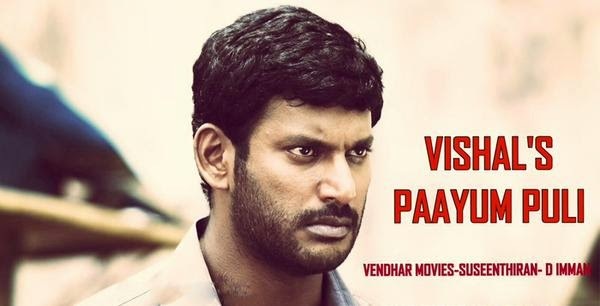 "Happy to announce my new film title with Mr.Vishal #paayumPuli. I'm sure this film will be bigger than Paandiyanaadu." The film, which is said to be based on a true story, Kajal Aggarwal and Aishwarya Dutta are playing lady lead roles for Vishal. Samuthirakani will be seen in a crucial role in Paayum Puli. Vishal Film Factory producing Paayum Puli music is by D Imman.